The site of the first DeKalb County Court session was held on October 9, 1837 in the home of Rufus Colton who was the first clerk of the court. The site on Coltonville Road is presently identified by a Historical Marker erected by the DAR in 1917 and DeKalb County in 2006. A bitter battle was waged over the exact site to be designated as the county seat of the new county of DeKalb. The settlements of Coltonville, Brush Point and Orange (now known as Sycamore) were competing for this distinction with Sycamore finally being designated as the county seat in 1839. The first of the three courthouses was a 20-by-30 foot two story wooden structure located on the south side of West State Street across from the present courthouse. This building was constructed of wood from various sawmills acquired by citizens as trades and donations and erected by volunteers. This building was used from 1839 until 1850. No photographs of this original structure are known to exist. As a memorial to the site of the first courthouse, a plaque is presently located on the front of an existing insurance building. The second courthouse, located at the present site, was a two-story brick structure, 60 feet long by 40 feet wide, containing a cupula-like clock tower and was completed in 1850. In 1864 a two-story addition was built to house certain county offices and eight years later vaults for records were added to the rear of the addition. In the fall of 1901 the County Board of Supervisors unanimously approved a resolution authorizing the construction of the third courthouse appropriating $100,000 for that purpose. On October 29, 1903 the cornerstone for the new courthouse was laid and construction continued through 1904 with the dedication occurring in 1905. This new courthouse is a three story building, 128 feet by 100 feet, with the exterior constructed of Bedford limestone quarried in Indiana. The interior contains many classic architectural features which were prominent in the early 1900’s. Several minor updates were made to the interior of the building throughout the years but no major renovations occurred until 1983 when Judge Rex F. Meilinger spearheaded a movement to renovate and restore the 78 year-old building to its original grace and grandeur. Maintaining all the classic and historical features of the structure was of utmost importance. Great care was taken in the restoration of the original furniture, doors, wood trim, plaster wo stained glass, Tennessee marble, bronze and brass used throughout the building to restore its original dignity and elegance. This renovation was completed in 1987. Due to increased demands on court services, all unrelated offices were moved from the courthouse to other locations in other county buildings. Only the courtrooms, the Circuit Clerks offices, Court Security, States Attorney’s offices and Court Services remained until the State’s Attorney’s Office and Court Services were relocated to the Legislative Center in 2002. At that time the Public Defender was relocated to a renovated space in the Courthouse basement. Several other minor renovations and updating have occurred between 1987 and 2010. 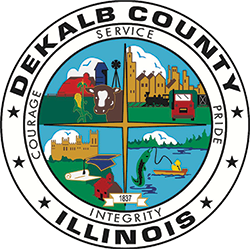 Sources: Joiner History Room Records, Sycamore True Republican, DeKalb County Historical & Genealogical Society and the DeKalb County Public Building Commission.